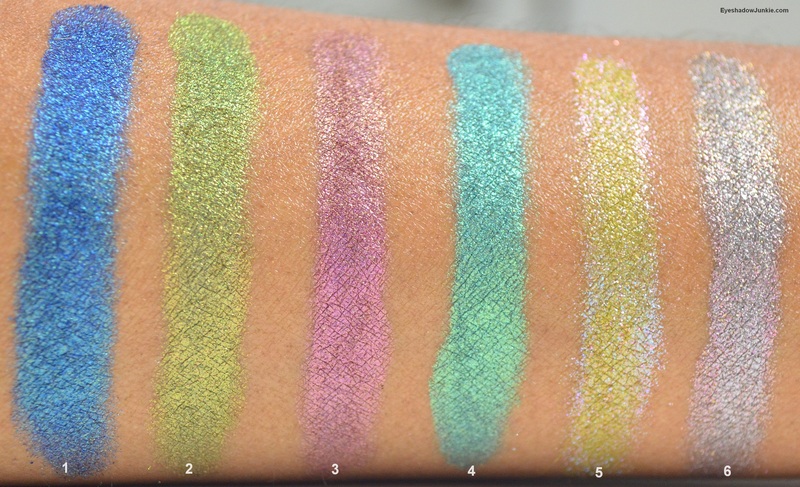 I look forward to Fyrinnae’s Halloween eye shadows every year, but this year’s collection is one of the best Fyrinnae has released in a while. 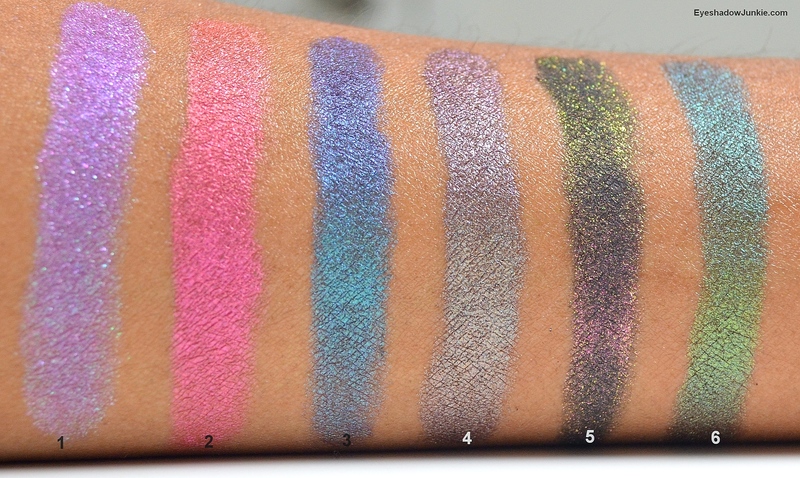 All of the shades are Arcane Magic’s (two are Exquisites) that change colors depending on the angle and lighting. I was so excited about this release and filling my basket so fast I bought a shade released this summer. 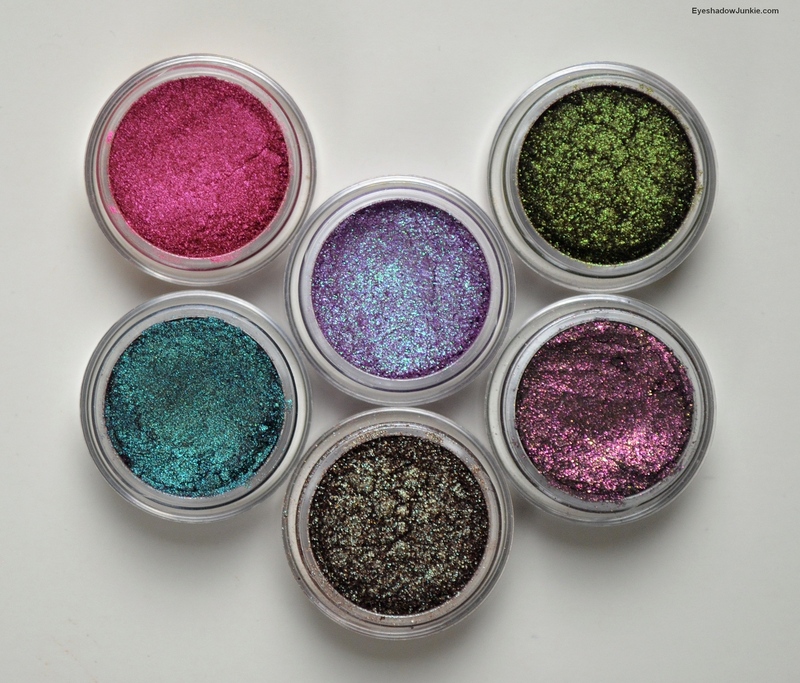 The eye shadows in this collection are really nice and the color changes are intense. I used Pixy Epoxy for my swatches, which brightens and intensifies the shades. The shades are prettier and easier to wear when worn over my favorite primer (Nars) without sacrificing the color shift. What is better is that these are not limited edition. You get 3 grams of product for $7.30 or a sample jar for $2.55. Top Row: Yurei’s Wrath, Lost Lenore, Incubus. Bottom Row: The Alchemist, Canterville Chase, Lady Glamis. Arcane Magic Lost Lenore is a medium purple with green sparkle that changes to pink-purple with pink sparkle. Arcane Magic Yurei’s Wrath is a cranberry red that changes to an orange-brown. 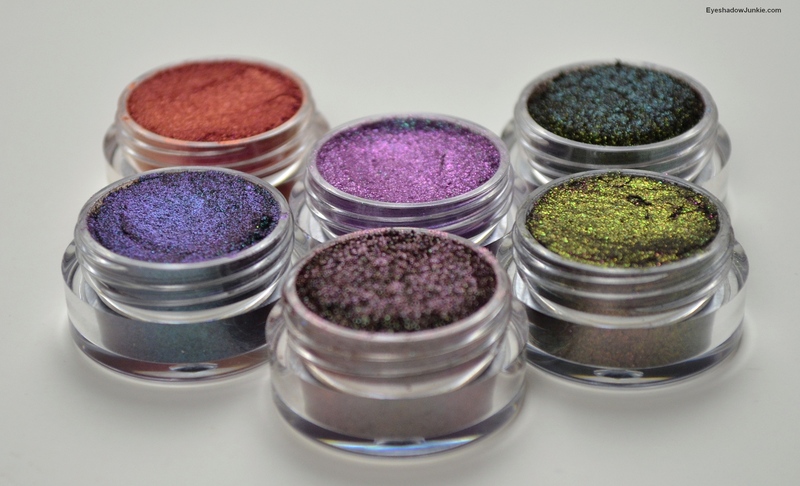 Arcane Magic The Alchemist has blue-green shimmer on a black base that changes to a dark pink-purple. Fyrinnae’s black base shades are more difficult to use and perform better on a sticky base. I’ve found blending these shade types with a fully brush muddies the color. Arcane Magic Canterville Chase has green shimmer and a touch of gold on a medium dark taupe brown base that changes to a pink-beige shade. In the pot, this shade looks like a dupe of Mac’s Club or Blue Brown pigment or Urban Decay’s Lounge, but it’s easier to wear. It makes a lovely “everyday” lid shade for dark complexions and a fantastic smoky eye for lighter skin tones. Arcane Magic Lady Glamis is pink-bronze sparkle that changes to a golden green on a dark base. This shade is all sparkle, very holiday worthy. The color change is intense, but the level of sparkle may turn some off. It performs better when applied with your finger on a sticky base. If you attempt to blend this with a brush, be prepared to pick shimmer off your entire face. Arcane Magic Incubus is not a Halloween shade, but new for summer 2015. (Oops, I was so excited at this release I wasn’t paying close attention.) It is a golden-green that changes to turquoise then purple. Top Row: Shipwreck, Wicked Faeries, Abandoned Hotel. Bottom Row: Forest Creatures, Werewolf Moon, Predjama Castle. Arcane Magic Shipwreck is a dark blue with bright green sparkle, which makes it look like a dark teal. The shade changes to all blue then violet. Arcane Magic Forest Creatures is a bronze and olive green shimmer that turns to a golden bright green to almost emerald depending on light and angle. Arcane Magic Wicked Faeries is a cranberry shade that changes to shimmery dark bronze-brown. Arcane Magic Werewolf Moon is a turquoise with golden-green highlight that becomes a bluish teal to almost violet when at an angle and closer to light. Arcane Magic Abandoned Hotel is a yellow green with a lot of turquoise-blue sparkle, which changes to pink sparkle. The color change for this shade is striking, but it’s very sparkly and fallout prone. A sticky base would be best for this shade or apply with finger if using a regular base/primer. Arcane Magic Predjama Castle is a silvery taupe with pink sparkle that changes to a golden green sparkle. 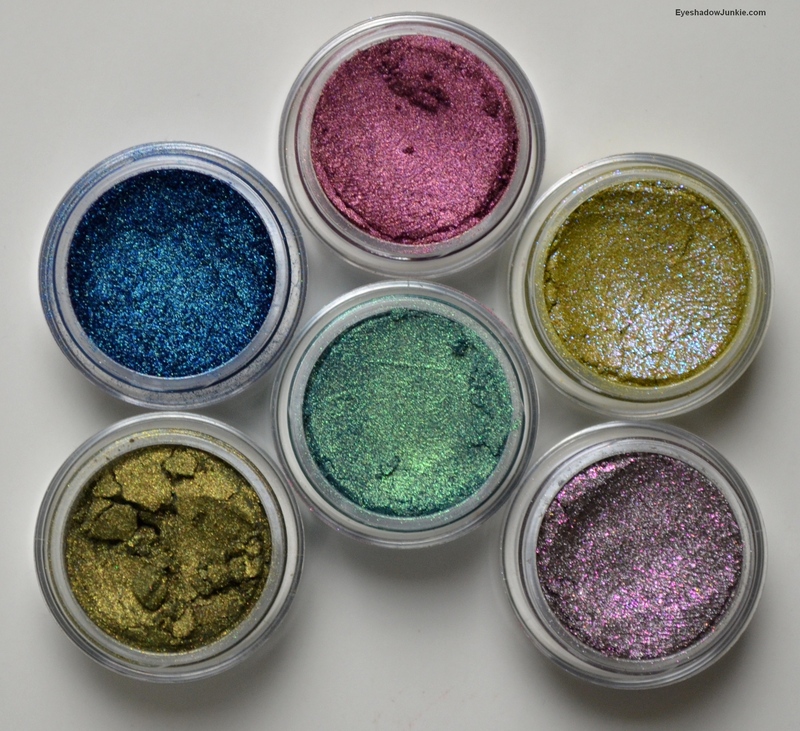 Hi I love your blog so much, especially Fyrinnae Arcane presentations. Thank you so much. Does Fyrinnae do the sales at certain time in a year? I’ve never seen a Fyrinnae sale in the last six years I’ve been buying from them. You can buy samples from them, which are a decent size and come in a container vs a bag for roughly $2.